Stephen M. Watson is an attorney at Carrell Blanton Ferris & Associates, PLC. Before embarking on an entrepreneurial role as President for Viatical Settlement Professionals, a life settlement brokerage firm, he was a partner at Coates & Davenport Law Firm. His interest in writing led to a collaboration on the New York Times Best Seller, The Takeover, and as Editor of Rocks Across the Pond, a book by Richard and Kathy Verlander, proud parents of Detroit Tigers’ ace Justin Verlander, and scholar and student athlete Ben Verlander. 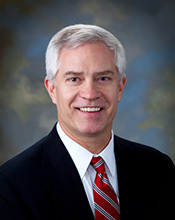 At Carrell Blanton Ferris, he practices in the area of Estate Planning and Estate Administration. Steve has been an active member of the Virginia Bar for over twenty-five years, has served as chairman of the Real Estate Section of the Richmond Bar Association, and has been published in the Trusts and Estates Newsletter of the Virginia State Bar.